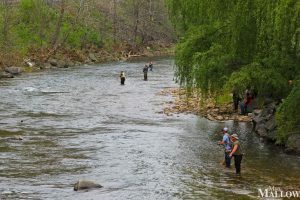 It is National Plan for Vacation Day and what’s better than planning a weekend getaway for the 15th Annual WV Trout Fest held May 3 – 5, 2019 in Franklin, WV? The weekend’s activities begin on Friday evening with a Fish Dinner at the Pendleton Community Building featuring WV Metro News Outdoor, Chris Lawrence as the guest speaker. Advance tickets are $12 and tickets at the door are $15. The dinner is walk-in style from 3:30pm – 6:30pm. Chris will speak about 5:30pm. If a fish dinner doesn’t appeal to you there will be outdoor food vendors at the TMF Craft Building. Come over and listen to Chris speak about his experiences in WV for a $5 fee. The Craft and Outdoors vendors will also be opening on Friday evening from 4-8pm. Inaugural Baby & Little Miss WV Trout Fest pageant will be held at 6:30pm at the back of the TMF Craft Building. Registration information is available at: Early registration for the Trout Rodeo and BoxCar Derby and packet pick up for the Inaugural WV Trout Fest 5k & Kids’ Run will take place in the TMF building from 4-8pm. On Sunday, the Inaugural WV Trout Fest 5k and Kids’ Mile will be held at Thorn Spring Park beginnings at 8am. This scenic course runs ‘along the thorn’ with continuous views of the Potomac River. Church in the Park will be held on Sunday at 11am at the Franklin Town Park. Afterwards enjoy the vendors, some good food, a performance by Lisa’s Dance Studio dancers at 1pm followed by the Polar Plunge at 2:30pm to end the weekend’s activities. More information is coming but now is the time to book your weekend stay in Pendleton County!